... Via X Prize Space Race News comes this item in which Brian Binnie describes the December flight fot he SS1: StarShipOne pilot keynotes awards lunch - DCMilitary.com - Apr.29.04. And this item about a discussion in New Mexico on the X PRIZE cup: Space Commission meets on Friday - Alamogordo News - Apr.29.04. X PRIZE countdown... Peter Diamandis expects a winner in a few months: X Prize Will Be Won by 'Summer's End', Event Organizer Says - Space.com - Apr.29.04. Alan Boyle is guessing that July 4th / July 17th would make good launch dates for the SpaceShipOne. ... In other X PRIZE news, the Canadian Arrow project is losing its home: Outta space: An astronaut centre is looking for a new home after its London facility is sold to a boat maker. - London Free Press - Apr.29.04 (via X Prize Space Race News). "The Canadian Arrow team successfully tested its 25,900-kilogram thrust engine for its rocket last month. It's expected to launch an unmanned flight off a barge in Lake Huron in the next few months, followed by a manned flight later in the year." Heavy lift isn't needed for the Moon/Mars program according to Dennis Wingo: Rebuttal to Comments by the Houston Chronicle and Robert Zubrin Regarding NASA's Hubble Repair Options - SpaceRef - Apr.29.04. Solar electric propulsion on the Orbital Recovery tug will allow it to bring the Hubble to the ISS for service and long term maintenance. (Will we ever stop hearing from some space "experts" that this is impossible?) Such a mission will prove the capabilities of in-space service and assembly and obviate the need for an expensive heavy lifter development project. The Delta 4 - Heavy lifting for the new millennium - The Space Review - Apr.26.04 - and Atlas 5 should provide sufficient lift capability until launch rates increase to the point a large RLV becomes affordable. LEO airships... As a follow-up to John Powell's presentation at SA' 04, I've posted JP Aerospace: Airships to Spaceships. Until the JP Aerospace site is updated, I hope this will help to illustrate the basic concept. ... X PRIZE announces that Kevin N. Kalkhoven, co-owner of Champ Car World Series and former head of JDS Uniphase, has joined the board of Trustees. Also, Eugene W. Roddenberry, Jr., son of the late Star Trek creator Gene Roddenberry, has joined the advisory committee. My review of Space Access ' 04 is now posted. The Rocket Company launches its first orbital flight in Chapter 24. 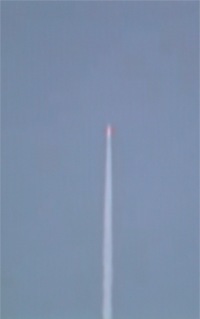 ... Space Transport posts a picture of their mobile launcher and reports on participation in the recent X PRIZE meeting. Back up to speed soon... Got back this evening after visiting friends in Prescott, AZ following the Space Access ' 04 last week. I hope to post a review of the meeting by Tuesday afternoon. Update Pause: I will attend the Space Access ' 04 Conference this week in Phoenix, Arizona. So site updates will be infrequent at best until next Tuesday, April 27th. I will provide a review of the meeting on my return. SpaceX Falcon I delay ... The latest issue of Space News reports that the first launch of the Falcon I has been delayed until the end of September. The main engine and its turbopump need further testing and a range safety issue has arisen. Elon Musk says the program is costing more than he expected. "Building Rockets - it ain't cheap." However, he still expects development costs for the Falcon I will total less than $100M and that the price per flight will remain at $6M. Musk says two customers have signed up for launches and several more are about to close contracts. The Team Encounter solar sail test flight will move from an Ariane 5 launch as a secondary payload to the Falcon I if the company can get permission from NASA. The sail will carry a navigation device funded by NASA. (The Team Encounter website already says they will use the Falcon I.) The first flight of the Falcon I will also carry a small cansiter containing ashes of human remains for the Celestis space burial company. Space Access '04 Conference Schedule & Info update has been released. The meeting starts this Thursday and lasts through Saturday night. See you there! Rocketry news ... Beyond Earth Enterprises launched its first large sounding rocket on April 17th and a NASA funded team launched a solid-fueled rocket with an aerospike nozzle. Details in Advanced Rocketry News. News brief... Leonard David gives an update on the X PRIZE: X Prize Entrants Race Against Time and Each Other - Space.com - Apr.19.04. Noticing private space ... This article - Private Citizens Aim to Make Space Public Domain - FOXNews.com - Apr.18.04 - reviews a range of private space projects in a generally favorable light. 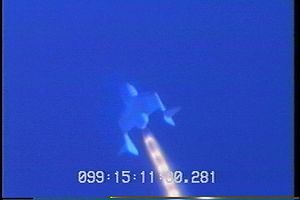 However, as noticed by one blogger - Print Media Reaction to SpaceShipOne and ISS Tourism - Jay Manifold - Apr.11.04 (via Transterrestrial Musings) there really wasn't much publicity about the most recent dramatic advance in private space development - the second SS1 powered flight. On the other hand, that flight was overlapped by a lot of publicity on the licensing of the SS1. Also, the worsening Iraq situation dominated the news. I expect that as the coming flights get higher and closer to the X PRIZE flights, the press and public awareness will rise considerably. Armadillo update... John Carmack reports on futher hover tests of their big vehicle (on a tether) plus continued development of a jet vane system as an alternative to differential throttling: Better liftoff, Jet vane vehicle - Armadillo Aerospace - Apr.18.04. Includes a hover test video. Rocket Company update... Last week in Chapter 23: Part 1 of the Rocket Company, the two stage rocket project encountered serious design problems with the thermal protection system and the landing gear for the orbital stage. In this week's Chapter 23: Part 2, solutions are found that add some weight but don't seriously delay the project. Also, the company starts to make vehicle sales projections and initiates public relations efforts like an international competition for a symphony to commemorate the launch of the vehicle. Taken from chase aircraft video. See two other flight photos. Rocket rides for memorabilia and student projects has been suggested as a possible market for rocket startups. Beyond-Earth Enterprises [former HS advertiser] has just announced (pdf) that it will pursue such a business with its high altitude rockets. See their store for a selection of Flight Kits for sending personal items and small educational experiments into space. SS1 flight test report has now been posted on the Scaled Composites test data page. Except for a brief delay in firing the rocket "to evaluate a shock induced stall buffet" everything went as planned and the vehicle performed very well. Russian space design concepts... The company Aerospace Systems is offering a number of ambitious space transport and space development concepts. See, for example, their high capacity tourist vehicles such as the suborbital Sea Launch Cruiser that would launch a bus load of space tourists from the Sea Launch platform at $10k per seat. XCOR in Popular Science... Continuing the theme of an article in the April issue on the world of alt.space, the May issue follow-on article My Rocket is Going to Get You to LEO!...and other rallying cries from the fringes of the final frontier includes a profile of Jeff Greason and the XCOR team. His O'Neillian spirit (inspired by Gerard O'Neill) is contrasted with a science oriented Saganite and a Big Space Program oriented von Braunian. A new heavy throwaway seems to be NASA's preferred system for lifting the lunar mission but the program may have to settle for the EELVs: NASA's Search for Moon-to-Mars Rockets Has Begun - Space.com - Apr.12.04. They've decided to go with expendables since "reusability only pays off when you have a high flight rate". As reader Kaido Kert, who sent me the link, notes: "This already makes the assumption that the 'reusable launcher' would be so big, that this 100 tons per mission wouldn't generate a high enough launch rate. But what if the RLV's LEO payload would be a single ton at low enough $/lb?" I certainly don't know all the issues involved in orbital assembly and just accept the frequently heard argument that it's generally better to reduce in-space construction as much as possible. On the other hand, there has got to be a price point for launch costs where below it orbital assembly becomes the cheaper way to go. I think NASA managers just take for granted that there is no way to reach that price point soon and are proceeding accordingly. This might change if SpaceX succeeds with the Falcon vehicles. These are only partially reusable but should be a lot cheaper than the EELVs. A brand new heavy lift expendable designed by NASA is bound to be enormously expensive. Whatever launch gospel NASA managers are pushing today, they have no doubt about it. Yet it always differs from last year and next year. Space Access ' 04 Update released over the weekend includes the latest on the list of speakers and on hotel room availability. Firing the engines... In this week's update, John Carmack reports on test firings of the engines on the large vehicle while it hung from a crane: Up in the air (sort of), Jet vanes, Big Engine V2.0 - Armadillo Aerospace - Apr.11.04. Includes a video (13.8MB) showing the firings. "Post test inspection showed that all the vehicle insulation held up well, with no signs of any heat damage. All the electronics stayed [operational] through everything, and all of our ground systems behaved as expected. We should have a nicer test next week." No government funding for SpaceX.... A clarification is given in the latest issue of Aviation Week with regard to its recent article on the company that implied the Falcon I project was partially funded by the military. "The $3 million being provided by U.S. Defense Dept. to SpaceX for the first launch of the Falcon I booster is a discounted price for procurement of the flight, as opposed to funding directly related to development of the launcher." X-33 tank fix... This issue of Aviation Week also has an article about the success Northrop Grumman has had in preventing the type of delamination problem that occurred in the composite liquid hydrogen tank for the X-33. The failure of the tank, along with a cascade of other problems and overruns, led to the cancellation of the project. Northrop used several techniques to prevent the "cryo-pumping" action that draws liquefied nitrogen into microcracks. The nitrogen changes there to gas when the tank warms up after draining. The gas expands and opens up the layering in the composite. The company used thinner plies, a thin foil and a venting technique to get rid of any nitrogen that does manage to get into the structure. The program was paid for by NASA Next Generation Launch Technology program. Since NASA seems to be cutting back on RLV development it isn't clear if anything will will be done with these findings on the short term. The Rocket Company has to deal with a crisis in the design of the orbital stage in Chapter 23: Stop the Production Line! Part 1. SS1 article gives an excellent first hand report on the flight: Rutan group rockets toward X-Prize: SpaceShipOne's flawless test has team closer to $10 million Antelope Valley Press - Apr.9.04 (Note: Avpress links are short lived unfortunately) - Link via a HS reader in Mojave. "After nearly an hour of climbing to the launch altitude in the military restricted airspace adjacent the Mojave Airport, SpaceShipOne dropped from its carrier and shortly after lighted the rocket motor. From the ground, it could be seen only as a vapor trail, yet its speed and trajectory made it distinct from the other contrails." "As the rocket burned out and the aircraft reached the top of its flight arc, Siebold could be heard over the radio to say 'The sky is dark.' He also commented that the rocket flight was 'remarkably quiet in the boost.'" "Erik Lindbergh , grandson of the pioneering aviator and vice president of the X-Prize Foundation, called the flight 'epic.'" "The first rocket flight was more nerve-wracking, Heath said, but the 40-second duration of this flight made it something different. 'Forty seconds is a long time,' [Kevin Heath of Scaled] said. 'We're just chomping at the bit to go 90 seconds,' the duration of rocket burn for the 100 km flight." The X PRIZE (100km) flight will be announced beforehand and web cast. "With that kind of publicity blitz planned, the Mojave Airport is making its own preparations for the large crowds anticipated to watch the attempt." More pictures at Alan Radecki's Mojave Airport Weblog. Takeoff through landing. BTW: Don't you think a lot of millionaires would pay $100k to ride on something like this. SS1 during flight as captured by an onlooker. 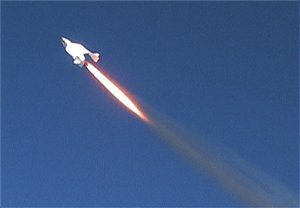 Hot on the heels of receiving it's FAA licence, the American SpaceShipOne team had a perfect rocket-powered flight today, April 8, reaching an altitude of 105,000 ft. Behind the controls of SpaceShipOne's second successful powered flight was pilot and future astronaut, Peter Siebold. The engine burned for 40 seconds and reached a speed of approximately Mach 2, making it the first privately built space vehicle to accomplish this feat. "105,000 feet down, 223,000 feet to go!" exclaimed an excited onlooker, as he watched the ship fly overhead. Norman, OK -- The Suborbital Institute today congratulated Scaled Composites of Mojave, CA for being the first firm to receive a Federal launch license for a piloted suborbital rocket. The Institute applauded the Federal Aviation Administration's Office of Commercial Space Transportation for its action in issuing the historic launch license, which was announced on April 7th. Scaled Composites, run by aviation legend Burt Rutan, is already in the process of test flying Spaceship One, a winged suborbital rocket designed to win the $10 million X-Prize. "We believe this action is another step in opening the road to space, creating a new industry and new opportunities for all Americans," said Institute Chairman Patrick Bahn. "Regulatory barriers have been a concern to suborbital entrepreneurs and investors, but this action shows that things are heading in the right direction." The Institute praised the FAA for streamlining past regulations that were considered overly burdensome, while at the same time protecting public safety. The Institute plans to work with the FAA and legislators to further streamline regulations in the future. The Institute was instrumental in supporting the Commercial Space Launch Amendments Act of 2004, which recently passed the House of Representatives by a wide margin. One provision of the HR 3752 would create a class of experimental launch permits, making it easier for companies like Scaled to test experimental rockets. Members and supporters of the Suborbital Institute will go to Capitol Hill on Monday and Tuesday, May 17-18, to lobby for passage of the HR 3752, which is now in the hands of the Senate. Pat Bahn extended an open invitation for supporters of commercial human spaceflight to join Institute members in the lobbying event. Interested parties may email edwright2000@hotmail.com to sign up. The Suborbital Institute is an industry association whose members include many firms involved in the development of suborbital commercial human spaceflight, including TGV Rockets, Armadillo Aerospace, Vela Technology Development, XCOR Aerospace, and X-Rocket, LLC. Membership is also open to members of the public who support the development of the suborbital commercial human spaceflight industry. WASHINGTON, DC - The U.S. Department of Transportation today announced it has issued the world’s first license for a sub-orbital manned rocket flight. The license was issued April 1 by the Federal Aviation Administration’s Office of Commercial Space Transportation to Scaled Composites of Mojave, Calif., headed by aviation record-holder Burt Rutan, for a sequence of sub-orbital flights spanning a one-year period. The FAA sub-orbital space flight license is required for U.S. contenders in the X-Prize competition, a high-stakes international race ultimately to launch a manned, reusable private vehicle into space and return it safely to Earth. The X- Prize foundation will award $10 million to the first company or organization to launch a vehicle capable of carrying three people to a height of 100 kilometers (62.5 miles), return them safely to Earth, and repeat the flight with the same vehicle within two weeks. Twenty-seven contestants representing seven countries have already registered for the X-Prize contest, modeled on the $25,000 Orteig Prize for which Charles Lindbergh flew solo from New York to Paris in 1927. In its 20 years of existence, the FAA’s Office of Commercial Space Transportation has licensed more than 150 commercial launches of unmanned expendable launch vehicles. This license is the first to authorize manned flight on a sub-orbital trajectory. While the highest criteria to issue a license is public safety, applicants must undergo an extensive pre- application process, demonstrate adequate financial responsibility to cover any potential losses, and meet strict environmental requirements. See also Feds Give Private Spaceship Go-Ahead to Expand Flight Testing - Space.com - Apr.7.04. News brief... The latest issue of Aviation Week includes a full page editorial by Jeff Greason of XCOR based on his testimony to the Aldrige Committee. He advocates that "NASA Should Use Commercial Space Transportation Exclusively." On April 1-3 the hydrogen peroxide monopropellant system completed four ground tests. On the last test we obtained 35% of the nominal thrust on 6 sec running. During this first test session we obtained all calculated parameters. At the end of April the system will be tested at full-specified thrust and time. ARCA is proud to announce that from the data we have until now, the system tested on April 1-3 is the world first reusable monopropellant propulsion system integrally constructed from composite materials. Also, this is the most powerful Romanian liquid fuel engine ever constructed. Photos and video are available on their web site. "Some officials said it could evolve into part of a launch system but acknowledged this would be 20-50 years off, if it happens at all." "The idea is the scramjet can lose this weight [of the oxidizer in a rocket] by obtaining oxygen from the atmosphere instead. The difficulty is in efficiently capturing this air without creating so much drag and heat that any benefits are wiped out." "The X-43A engine is a passive copper heat sink with total-loss water cooling of the inlet lip. That may be okay for 10 sec. but cooling becomes a big issue for longer runs." See also Rand Simberg's recent article. To try to make a X PRIZE launch before the end of this year, the IL Aerospace team modified its original system with a new balloon design and the use of a commercial solid rocket booster: See the discussion of the modifications to the system. NASA considers fly-off competitions for the CEV: NASA spacecraft fly-off under study by Frank Sietzen - UPI - Apr.1.04. This is the kind of approach to hardware development that the alt.space community has been advocating for years. Assuming they open up the competition to more than the usual suspects, this could bring NASA significant cost savings. White Knight flights took place on March 30 and 31st according to the Tier 1 test page. These were for " Avionics software evaluation, launch release rehearsal and landing pattern practice. "and "SpaceShipOne Flight 13P launch rehearsal, avionics checkout and landing practice." TGV update ... I believe I missed this article from January on TGV Rockets and the company's new base in Norman Oklahoma: Rocket science? 'Two guys and a van' handle it - The Norman Transcript - Jan.25.04. As indicated by the article, the company has a growing group of professional engineers. Mark Oakley, aka Rocket Man, recently joined the effort: TGV Rockets - Rocket Man Blog - Mar.11.04. I saw Pat Bahn, chief of the company, this week in Bethesda. He is traveling frequently between the DC area and Norman. He said the company is making progress and after a major design scrub with several outside reviewers they froze the basic design of the MICHELLE B (don't know if this page gives the latest numbers; the review led to a larger vehicle.) Now they will focus on working out the final details. News brief ... While Northop may issue press releases with grand claims about its reusable engines, an XCORian pointed out to me that they have been making reusable engines with non-toxic fuels for over three years.